Download this Direct Loans General Forbearance Request Form that has been created specifically to assist those who have federal education loans but are unable to make the payments. 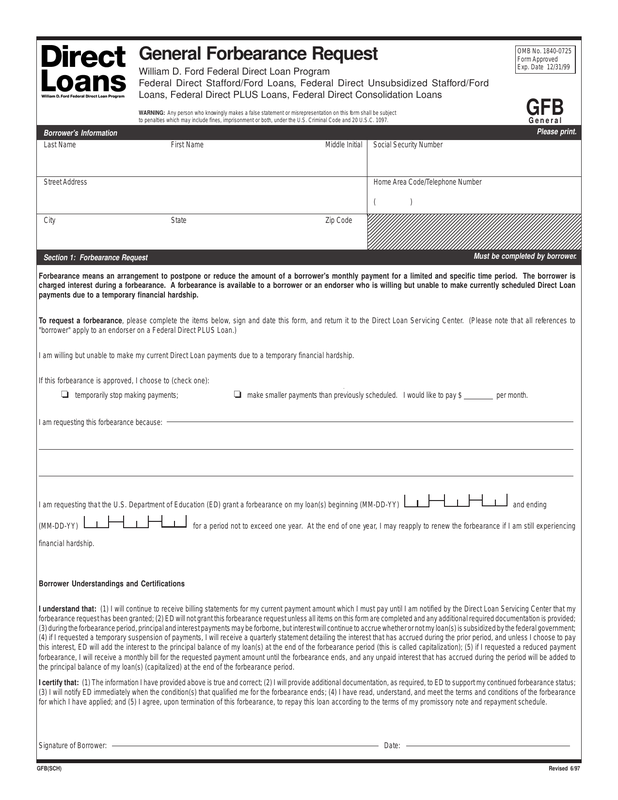 Completion of this form will provide an opportunity for the owner of the loan to receive added time to begin repayment. Forbearance means an arrangement to postpone or reduce the amount of a borrower’s monthly payment for a limited and specific time period. The borrower is charged interest during a forbearance. A forbearance is available to a borrower or an endorser who is willing but unable to make currently scheduled Direct Loan payments due to a temporary financial hardship. I am willing but unable to make my current Direct Loan payments due to a temporary financial hardship.